Your final is a take-home activity. You can and should use all of the resources from the course as you work on your exam. For your final exam, you will write a performance review that evaluates your work in the course. You will propose the grade you should receive, using information from your Labor Log to support your recommendation. In the workplace, this report would be similar to a annual self-evaluation. Note: there is no grace period for this assignment. If you do not submit your exam on time (or do not submit it at all), your grade in the course will be lowered. Step 1: Familiarize yourself with the characteristics and features of performance reviews. Note that these examples are by students who were analyzing their participation in the course. You are evaluating your labor, so your content will be different. Step 2: Review your work in the course and gather your data. What have you done to work consistently during the entire term? Which document demonstrates your highest quality work? Why? What demonstrates that you invested your best effort in the course? How have you supported members of your writing group and others in the class? Did you explain any issues that came up that harmed your participation (such as illness)? Did you complete the SPOT survey for the course? Providing an ongoing leadership role. Helping to teach the class new things. Significantly adding support to the writing community. Gather the relevant numbers, links to examples, and pull out quotations or other evidence from your work. Remember that you are focusing on your work in the entire course, following the definition of labor on the Requirements page and in your Labor Log instructions. Step 3: Compare your findings to the course expectations. Be sure that you consider your work in the entire course, and if relevant, be honest about where you fell short. Step 4: Pay attention to the expectations for the final exam. a conclusion of the grade you should receive for the course. Your performance review should be specific and detailed, since I will go by the information in your report as I determine your grade. If you do not provide adequate, specific details, your course grade may be effected. Step 5: Compose your final exam. Once you have gathered all of your information and drawn conclusions about your performance in the course, write your review in your word processor. Explain your findings, present your evidence, and include an indication of how your work in the course compares to the expectations. Your report should be professional, and avoid any whining, begging, or the like. Use what you know about layout and design to create a report that is clear and easy to read. If it’s also fun and interesting, that’s great too. Since the report focuses on your grade in the course, you do not need to share your draft with your writing group. Your grade in the course is private and personal, and any assignment to share details about your grade would be a FERPA violation. Step 6. Review your exam for design and basic writing errors. Everything you write should use accurate/appropriate image editing, grammar, spelling, punctuation, mechanics, linking, and formatting. These are important basic writing skills that you should have developed in high school. Also review your project, considering the layout and design of your project. Refer to the details on the course website listed in the Ten Ways to Improve Your Writing and the grammar and design Lynda.com videos included on that page. Step 7: Skip the usual self-assessment. Since this entire document is a self-assessment, there is no need for a separate document. Step 8: Submit your project in Canvas. Upload your completed self-assessment and your project in Canvas. 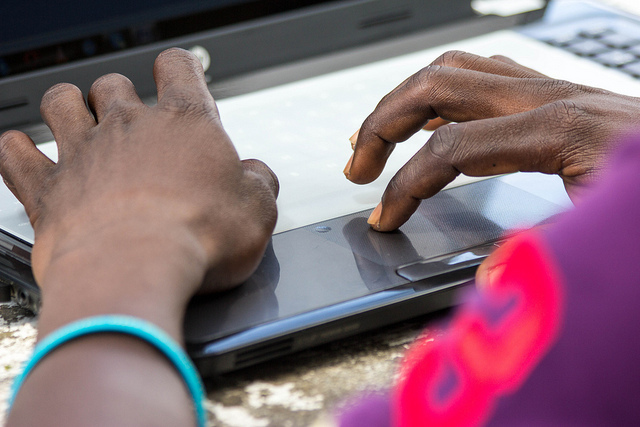 Photo Credit: Typing II by OER Africa on Flickr, used under a CC-BY 2.0 license.